We’re ending Autism Awareness month with a HUGE giveaway. Fill out this simple survey and we’ll enter you to win one of our Assessment Kits for students with Autism. Valued at over $1000.00, this highly in-demand kit can be used to both assess & teach criticial skills to students with Autism Spectrum Disorder and other special needs. 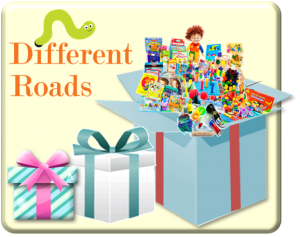 It contains flashcards, manipulatives, puzzles, and much more. You can keep the kit or have us send it to an organization or school of your choice. *Unfortunately, this offer is valid only for U.S. Residents. Survey closes on April 30, 2012. Good luck! Written by: Different Roads to Learning on April 28, 2012. This entry was posted in ABA, Autism Awareness, Products by Different Roads to Learning. Bookmark the permalink.